Stand Up! is meant to motivate, inspire and uplift those who are resisting the present administration's use of fear, hate and division to subvert the Constitution and seize power from every American. 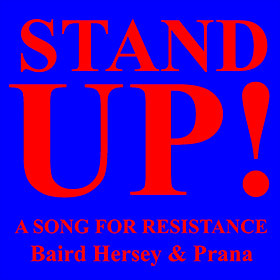 As I wrote this tune I was drawn back to one of my first political experiences. The only instruments on this recording are drums and the human voice. © 2017 Hersey Music. All rights reserved. Unauthorized duplication is a violation of applicable laws. It was a sitting-in on the boardwalk in front of the Democratic Convention in Atlantic City in 1964. We sang "Oh Freedom" and "We Shall Overcome" with members of CORE. We were there to support the black delegation from Mississippi getting seated at the convention. I tried to infuse this music with the same passion and vigilance I felt from those songs. The funds from the sale of "Stand Up!" will be donated to: The ACLU, The SPLC, Planned Parenthood and the NAACP. In 2014 Garry Kvistad invited Baird Hersey to his studio to show him a new instrument that he had built. Two years later the result of that meeting is a new recording, Chiaroscuro. The album is a suite of pieces which combines ancient, traditional and innovative instruments and vocal techniques blended to create a sound never heard before. Garry Kvistad is a member of Nexus, one of the most influential percussion ensembles of the the last 50 years. 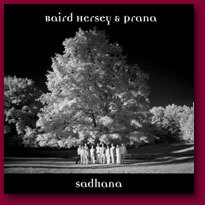 Baird is a composer and the leader of Prana, a group of harmonic singers with the ability to sing two pitches at once. That ability was the reason Garry had invited Baird to come hear his new instrument, the vistaphone. It is a four octave set of chimes that are tuned to the harmonic series, the same scale and tuning that harmonic singers use in producing their second, higher pitch. As Baird began to sing harmonics Garry played matching pitches on the vistaphone. The resulting combined sound was strikingly unique and beautiful. Garry immediately asked Baird to compose for the new instrument. The only instruments on this recording are percussion and voice. In Italian, Chiaroscuro means light-dark. It defines a style of painting that evolved in the mid 1600s which emphasized the contrast of darkness and illumination. Hersey.s suite of pieces explores the juxtaposition and intersection of darkness and light in tuning, timbre and rhythm. There are four sections that use the etherial sound combination of harmonic singing, and the vistaphone. The three other interstitial sections counterbalance that quality with the earthly grounding of world and orchestral percussion supporting rhythmic, antiphonal and harmonic vocals. The innovative, the traditional, and the ancient, are all within the sound of Chiaroscuro. It is the innovative palette of a new instrument (vistaphone) in combination with an extended vocal technique (harmonic singing). It is the traditional sounds of western orchestral percussion (vibraphone, xylophone, orchestral drums, glockenspiel, and marimba) and western vocal music (classical, jazz and pop). It is also the ancient lineages of world percussion styles and instruments (Balinese gamelan genders, tuned Balinese and Chinese gongs) and vocal techniques (Tibetan Buddhist chant, Tuvan throat singing and Ituri polyphony). Innovation, tradition and the ancient all intertwine to create a truly unprecedented sound. Three additional rhythmic vocal pieces without percussion, Vox Pulsatio (The Voice of the Heartbeat) are also included in the album. The interlocking vocal rhythms on The Lord of the Monkeys are based on the Balinese Monkey chant or Cak as taught to Hersey by Dr. I. Made Bandem. Garry Kvistad, Bob Becker Bill Cahn and Russell Hartenberger are the members of Nexus. Steve Reich said they are "probably the most acclaimed percussion group on earth". Nexus tours extensively and has performed four times at the Kennedy Center, twice at Royal Albert Hall, five times in Carnegie Hall and at more than 60 international festivals. In Sanskrit Sadhana means ‘practice’. The deeper meaning of Sadhana is a spiritual practice that helps to cultivate self-knowledge and, ultimately, leads to inner freedom. On Sadhana, the 12 pieces are arranged as a practice. The entrance into the practice is The Mani Wheel. It is like a prayer wheel at the entrance to Buddhist temple spinning, spreading and expanding into the Universe the prayers and blessings it is imprinted with and contains. Then, Invocation, a prayer said before the practice of Ashtanga Yoga to invoke Patanjali, the author of the Yoga Sutras. Swimming in the Eyes of Desire is, as the title implies a vocal meditation on desire. Om Mani Padme Hum, which translates as “The jewel in the heart of the lotus” is a musical setting of this prayer for enlightenment for all beings. There is a famous image of Vishnu sleeping on a snake, floating on the ocean of the cosmos. He dreams the Universe into existence in the form of a lotus growing out of his navel. This image is the inspiration for the 5th piece, Ocean of Bliss. The 6th piece recites the last line of The Hear Sutra, “Gate, gate, paragate, parasamgate bodhi svaha”, which means, go beyond, go beyond, beyond go beyond beyond beyond, to awaken in enlightenment. The grief over the loss of family or friend is expressed in Awakening the Compassionate Heart. For Between Heaven and Earth a Chod Healing Ceremony was it’s catalyst. In that ceremony the recipient lies down and Buddhist monks and nuns chant and ring bells so the receiver may regain health. Transformation is a meditation on devoted practice over time. Across the Waters is dedicated to refugees everywhere who have been forced to leave their country, home, and hearth. The practice ends with the Closing Prayer. It too draws on Ashtanga Yoga for the prayer recited at the end of practice. The line “lokaha samastaha sukhino bhavantu” means, may all being everywhere be happy and free, followed by the refrain of “Om shanti, shanti, shanti” or peace, peace, peace, to dance us back into the world. 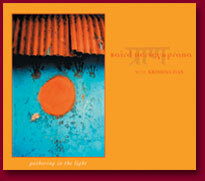 The album closes with another collaboration with Krishna Das. He is featured here on his chant, My Foolish Heart, which he sings over Hersey’s arrangement for Prana. Jerry Marotta is on drums and percussion. Subash Chandran and Ganesh Kumar are on percussion on The Mani Wheel. More than 2000 years ago Patanjali, a sage in India said "Yoga is the cessation of the fluctuations of the mind". In his work, the Yogasutras, he offers the precepts for the practice of yoga through it's Eight Limbs: 1. Self-restraint, 2. Internal disci pline, 3. Postures, 4. Breath control, 5. Withdrawal of the senses, 6. Concentration, 7. Meditation, 8. Complete Union. The object of the eight limbed path is to lead us to stillness of the mind. The only sound on this recording is the human voice and reverberation. After the release of "Waking the Cobra" Baird began work on a new solo project "The Eternal Embrace" A musical meditation on the Eight Limbs. It was to be an album of overtone singing with instrumental accompaniment; tamboura, gong, marimba, bull roarer etc. One instrument per piece. One piece per limb. 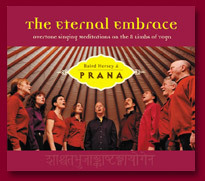 He had recorded all of the instrumental tracks when he brought together the singers of PRANA . After a year of performing "Waking the Cobra" with the group. He hit upon the idea of of arranging the sound of each instrumental piece for the eight voices of PRANA. The result is a suite of pieces to find a deeper understanding of the meaning of each limbs through pure sound. The twelve pieces are sung by the unaccompanied voices of Prana without text. Instead they use the perfection of harmonic intervals to bring t he listener limb by limb to a deeper state of relaxation and peace. 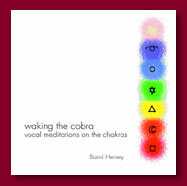 Waking the Cobra is an overtone singing Chakra meditation CD. The suite of seven short pieces was originally recorded as a Christmas gift for 12 friends. More than half of those friends were Yoga teachers. They started playing it in their classes. And it took on a life of it's own. People began calling Baird and asking him for copies which initially he was burning individually on his computer. The demand became so great he decided to put out a commercial CD. To fill out the album he recorded three additional pieces. The CD opens with a piece called "Atha", a Sanskrit word which means, "May the following have an auspicious beginning and successful end". It is the opening word of Patanjali's Yogasutras. 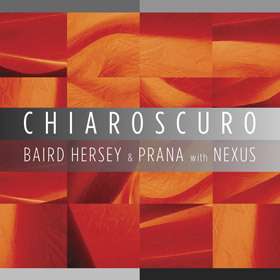 The only thing other than reverberation on this recording is the sound of Baird's voice. Next, is the title piece, "Waking the Cobra " which is in fact a collection of seven short pieces. They are meditations on the traditional shape, color, element and sound for each of the chakras. Hersey first recorded a multi-layered vocal background drone or moving harmony. Then, singing two pitches at once, he recorded the high melody parts. This is followed by an extended piece called "The Conch Shell, The Wheel and the Sword". These words are taken from the invocation chanted before beginning the practice of Ashtanga Yoga. Call and response, rising harmonies, vocal textures, and overtone melodies, are used in this extended piece to investigate the symbolic meaning of the objects. The CD concludes with "Between Sthira and Sukha. This is a phrase from Patanjali's Yogasutras which means between alert steadiness and relaxed comfort. This piece searches to balance those qualities by alternating low Multiphonic voice overtone singing and high falsetto harmonies.